It landfill site was saturated in 2002, and the civic body has been "looking for an alternative site for long time, but a clearance from the NGT is needed". 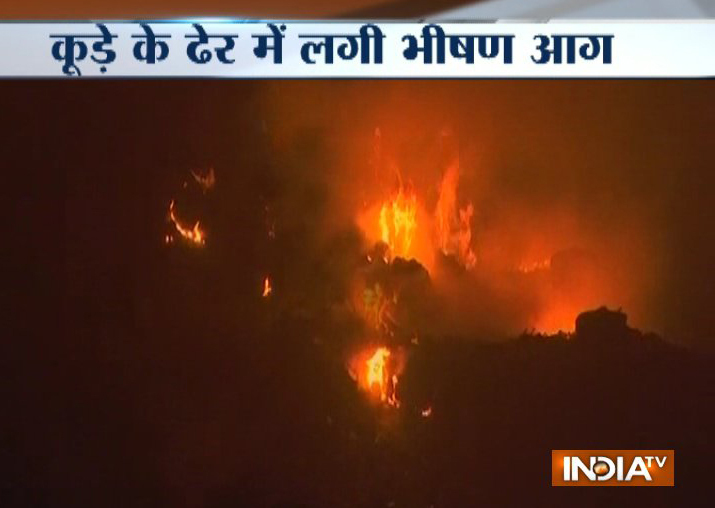 The Ghazipur landfill site in east Delhi, which had partially collapsed triggering a fatal accident recently, caught fire this evening, though no one has been injured, a fire service official said. Five fire tenders have been rushed to spot and the firefighters are still trying to douse the flames, the Delhi Fire Service said. "We received a call about the fire incident at about 5:50 pm. Senior officials are also at the site," a fire service official said, adding, "no one has been injured". Asked about the cause of the fire, he said, "It has not been ascertained yet. It could be that someone threw a cigarette or a beedi that triggered it." The 45-m high landfill was shut down following an order by Lt. Governor Anil Baijal in the wake of the collapse incident in which two persons were killed. The East Delhi Municipal Corporation manages the landfill site that was started in 1984 and is spread over 29 acres. According to officials, the permissible height for a garbage dump is 20 metres. Every day, 2,500-3000 metric tonnes of garbage are dumped at the Ghazipur site.